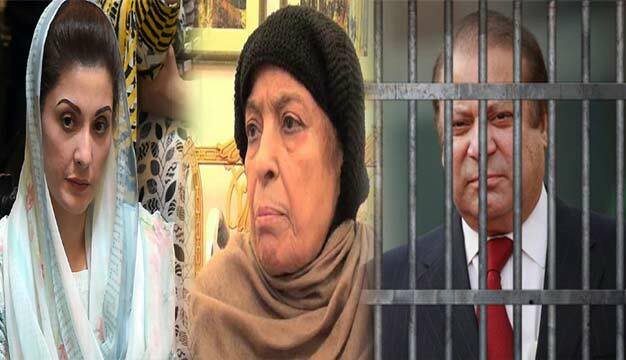 LAHORE: Former Prime Minister Nawaz Sharif’s daughter Maryam Nawaz, mother and brother visited him at Kot Lakhpat Jail here on Thursday. Quite a good number of PML-N workers were also present there to support their leaders. They chanted slogans at the arrival of Sharif family at the Kot Lakhpat Jail where former premier is imprisoned under corruption charges in Azizia Mills case. Maryam Nawaz also said that her father will not see any other visitors on Thursday, a day fixed for convicts to see visitors, because of his deteriorating health conditions. Due to MNS’s health condition, he will not be able to receive any visitors tomorrow. May Allah SWT bless him with long life & good health. Ameen. We all need him. Pak needs him. Thank you everyone for your kind & continuous support. Means a lot to me. On Wednesday, the new Joint Investigation Team (JIT) formed by the Home department of Punjab Government probing the 2014 Model Town incident also visited the former premier at Kot Lakhpat Jail and interrogated for about two hours and recorded his statement. The allegations against Mr. Sharif are that the Model Town operation was launched by the police at his and other PML-N stalwarts’ behest. Many workers and supporters of Pakistan Awami Tehreek were killed and injured during the anti-encroachment drive by Punjab Police outside his residence in Model Town.